At the recent 2008 AGU meeting in San Francisco, a long simmering controversy reared its head again. Paleontologists Gerta Keller and Sunil Bajpai and geophysicist Vincent Courtillot presented evidence that India’s Deccan Traps, and not the Chicxlub meteor in Mexico, created the unhealthful conditions that led to the extinction of the dinosaurs. Their data is thought provoking but what attracted my attention was Dr. Keller’s comment that much of their data came from quarries in the basalt. Erupted 65 million years ago, the Deccan Traps covers an area as large as Texas. Geologists have estimated the volume at 1.2 million cubic kilometers, with nearly half lost to erosion. The depth of the layers is more than 3,500 meters thick. At AGU, Keller observed that the viscous basalt spewed forth in as little as 10,000 years. 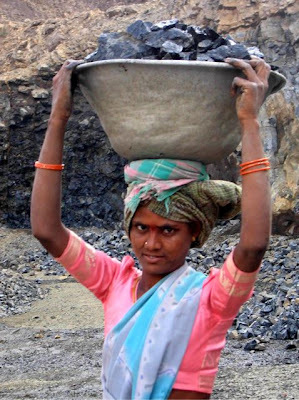 The quarries that interest Keller and her colleagues are found in flows that oozed 800 kilometers across India to Rajahmundry, on India’s east coast. They are the longest lava flows on Earth. Dozens of quarries pockmark the Rajahmundry traps of the Deccan plateau. (Trap refers to any dark colored igneous rock though it is most commonly associated with basalt; trap comes from the Swiss word for step.) According to Dr. Keller, families and extended clans work most of the quarry sites by hand, using hammers and explosives. Men break up the stone and women carry it out on their heads. And in some cases, trucks transport rock to people’s homes and dump the material in their backyards, where they work on it. Because the Rajahmundry basalt resists weathering, much of it goes for roads and to make train beds. It is shipped to Europe and perhaps to the United States. 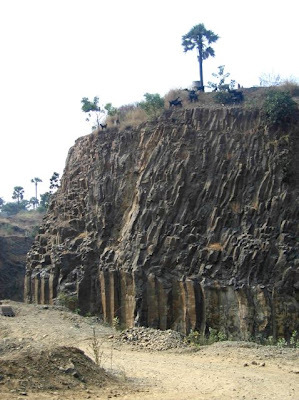 Basalt from other flows in India have been used as a building stone, though Dr. Keller did not know if the Rajahmundry stone had gone into buildings. The quarries have played an important role in Dr. Keller’s research because they expose the rocks that she has wanted to study. In the quarries is evidence for shallow marine deposition, where marine microfossils were preserved. These fossils have been essential to narrowing the date of Deccan Trap deposition and allowing Dr. Keller to further elaborate on her thesis. I am not qualified to say whether her theory is right or wrong, but the work raises some interesting questions and if Dr. Keller is right, you may want to give a second thought to the road you travel on. It may contain evidence for the dinosaur’s demise. A most excellent post! I saw some of the Deccan-related sessions because I’ve followed the story for a long time. There is a lot of stubborn, and partly irrational, resistance to her discoveries, but if we don’t keep pushing the bounds of our ruling hypotheses we will stop progressing. Thank you for getting those photos, too. Yes, those who fight accepted wisdom have tough battles but if they marshall their data, their observations can lead to new insights for both sides.